Jack Trudeau. Now that is a walk down memory lane for Indianapolis Colts and fans of the original Tecmo Bowl game on the Nintendo. 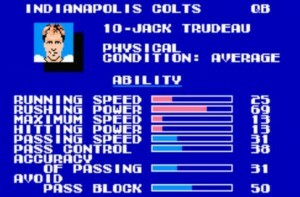 Trudeau was the slowest, and most ineffective quarterback in the original Tecmo Bowl game. He was incredibly easy to intercept. Let’s not forget the roster which had such notables as Pat Beach and Albert Bentley (since Eric Dickerson would not allow the makers to use his likeness). 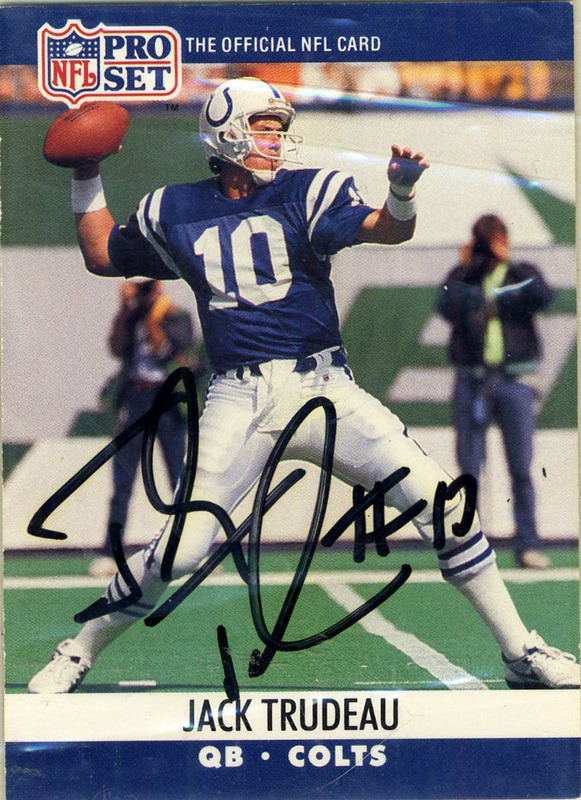 It was tantamount to insult if you beat somebody with the hapless Colts, and the easiest way to win with them was to kick 60 yard field goals with Dean Biasucci. That aside, you can tell the makers clearly based his ability on his statistical output, as Trudeau throughout 1987 shared quarterbacking duties with Gary Hogeboom, (yes the one from Survivor). Again in 1988 and 1989, Jack shared QB duties, this time with Chris Chandler. He’d then have to go toe to toe with cannon-armed overall #1 pick Jeff George in 1990. (Oddly Trudeau never earned the respect of the Colts fans and from the organization, despite playing for the Fighting Illini in college.) In 1994, he played for the Jets, and then was selected by the Carolina Panthers in their expansion draft (#56) where he served as the team’s 3rd team quarterback behind Frank Reich and rookie Kerry Collins. He retired after the 1995 season. After retirement Trudeau bought a golf course and has been President of Enviro-Save USA, an environmentally conscious corporation that deals in fuel saving technology and production. He’s also garnered quite a following on the radio, where his morning talk show at WNDE AM 1260 (Indianapolis) was picked up in 2011 for national syndication.